When I sent an e-mail congratulating Mallika Sarabhai for her decision to fight the election, she responded immediately and invited me to meet her during my visit to Ahmedabad. The day I arrived, her cousin Srilatha Swaminathan (daughter of her late uncle, lawyer Govind Swaminathan) was at her residence with her husband to lend support to her. Srilatha is an actor from NSD, a Central Committee member of Communist party (CPI –ML). She had driven for hours form Jaipur to arrive in time for the evening press conference held in the compound of Chidambaram, residence of Mallika at Usmanpura. We had a lunch appointment with Mallika's mother Mrinalini Sarabhai. Mallika was to join us along with her son Revanta, daughter Anahita, Bipin Shah and others. 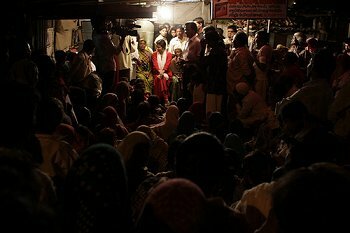 She had gone to address a rally of women at some village. So we were told to go ahead and I caught up with Mrinalini whom all address as Amma. 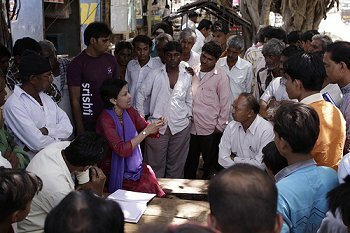 On 5th April 2009 leading citizens and NGOs in the city had adopted Mallika as their independent candidate for the upcoming elections. She is contesting from the Gandhinagar parliamentary constituency. A sun tanned Mallika joined us at the dining table, tall, vivacious, with a winning broad smile, wearing a large bindi, earrings and a purple scarf thrown over her shoulders. Mallika: I am contesting because I have more than twenty years of experience working in grass roots development. Two years ago you saw my production 'Unsuni' at IIM Bangalore and at the end of the presentation during Q and A you had asked me about the women scavengers about whom I had enacted a scene, remember? Sunil: You spoke about secularism. Mallika: Yes, main reason is to uphold the constitutional values of secularism and democracy. Sunil: There were legal cases filed against you. Have they been cleared? Mallika: Yes. If you have not committed any crime and some smart people frame charges against you, after a while it gets cleared. I believe in fighting fearlessly, confronting the politics of hatred, divisiveness and exclusion. Sunil: Tell us more about using art as an agent for change. Mallika: In my productions like 'Unsuni' and 'Unsuni: Two,' I use arts creatively and innovatively, combining it with my management education to create effective ways of addressing issues of social relevance. You witnessed the response at IIM, Bangalore. As an activist, I gave more than 32 free performances in various schools, institutions and held Q and A after the performances to engage audiences in a dialogue and create awareness about issues which generally are pushed under the carpet. Or else we are comfortable with our lives and live without giving much thought to such issues. Mallika: That is fundamental. The phrase empowering women has become a cliché, but one has to consciously work towards it. Sunil: At 55, you think this is the right age to plunge headlong into active politics? Mallika: Why not? I have several advantages. I belong to a family that has fought for India's freedom and for three generations, has contributed significantly in the areas of science, arts, industry and education. As a Global Gujarati, I welcome influences from all directions, without getting swayed away by anyone. I have acted in Gujarati films, have a busy career as a classical and contemporary dancer, am known nationally and internationally and have support from so many NGOs and public. I am not limited by partisan politics and power struggles. Sunil: In CNN-IBN channel interview, you explained about corporate sector's stand and governance in Gujarat under Narendra Modi. Mallika: Doubtless corporate sector's main aim is to make profit. If there are fewer hassles, they are happy to give in to the ruling government, as the supposedly good governance gives them scope for more profiteering. But there is also social responsibility and I beseech and appeal to corporate sector to fulfill those responsibilities. Mallika: That is the point I made and told the interviewer and electronic media to reach out to this comfortable class and wake them up. It is the duty of interviewers and editors of such channels to play that role. And the interviewer agreed graciously! Mallika made an impassioned speech. In the evening Srilatha Swaminathan with Gujarat Communist Party representatives made a speech and announced that the Communist Party of India (Marxist Leninist) is pleased to announce its official support to Mallika Sarabhai who is standing as an independent candidate from the Gandhinagar constituency; recognizes she represents those democratic, progressive and secular forces, which the CPI(ML) wishes to encourage in the country; recognizes that Mallika will not compromise with conservative, corrupt and communal forces which are trying to take this country backward and applaud Mallika and other like-minded people in Gujarat to continue to fight for justice for victims of the communal conflagration that erupted in Gujarat in 2002. 1 How many and what kind of questions have you raised in the Lok Sabha and about Gandhinagar in the last five years? 2 Why have you not spoken against the violence and atrocities against women in Gujarat and specifically Gandhinagar? 3 What efforts have you made towards opportunities for education and livelihood generation in the rural areas of Gandhinagar constituency? 4 Have you used funds under MPLADS scheme to benefit the deprived and underprivileged in your constituency? 5 Despite being the MP of this constituency for so many years, why have you not shown any concern towards the local issues of the constituency as well as the Gujarat state? Mrinalini Sarabhai, Anahita, Revanta, Srilatha and few friends retired to the drawing room where after some time many common friends joined us to learn Mallika's other plans of addressing women groups. I have known Mallika for many years. I am a great admirer of hers and respect her for her decision to join politics. She is bound to raise questions irrespective of the fact whether she wins the election or not. The awareness she has generated has won her a lot of goodwill. Both through her art and activities, Mallika has shown exemplary courage to articulate voices of women who are less privileged. People remember that she was the first dancer/artiste to protest against the powers that be, when atrocities were committed during Godhra riots. For her public statements, she has been harassed but she never gave it up. I recall, my friend Dileep Padgaonkar, the former editor of The Times of India had called me in the morning when Mallika's photo and statements were published on the front page of The Times of India. There are few politically conscious, active dancers who have displayed courage of conviction and worked towards the upliftment of marginalized section of the society.